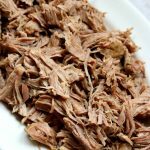 If you love pulled pork and you love a smoked flavor on your meat but you don’t have hours to spend you’re going to love this easy pressure cooker smoky shredded pork. This recipe can also be made in the slow cooker. Quarter the pork and then place pork in bottom of Instant Pot or the slow cooker. Pour all the other ingredients over the top of the pork. For the Instant Pot: Cover and make sure valve is on “sealing.” Set the manual button for 70 minutes. When the time is up let the pressure release naturally for 15 minutes. Release any extra pressure by gently pushing the valve to “venting.” For the Slow Cooker: cover and cook on low for 8-12 hours, or until meat is very tender. Transfer the meat to a cutting board and shred with a fork. It should be ultra tender. Serve meat plain, on sandwiches, in a salad, in a taco or however you want! If you want to add bbq sauce to make it more flavorful you can do that too. For this Instant Pot/Crockpot “Smoked” Pulled Pork recipe I used this Instant Pot IP-LUX60 V3 Programmable Electric Pressure Cooker. It’s 6 quarts, so the same size as most slow cookers. It cost me around $80 on Amazon. When I cooked it in the slow cooker I used my 6 Quart oval Kitchenaid Slow Cooker.